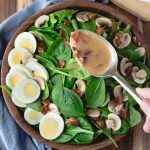 Fresh baby spinach with warm bacon dressing is a hearty salad classic which includes hard boiled eggs, bacon, mushrooms, and onions, mixed with a warm tangy-sweet dressing. Maybe you’re like me and always have hard boiled eggs in the refrigerator? If that’s a “yes”, then this is a great recipe to use up any stragglers at weeks end. I can’t tell you where the recipe for this wilted spinach salad originated, but my mother made it in the 1970’s or 80’s. Considered a stylish salad mom often served it for ladies luncheons. 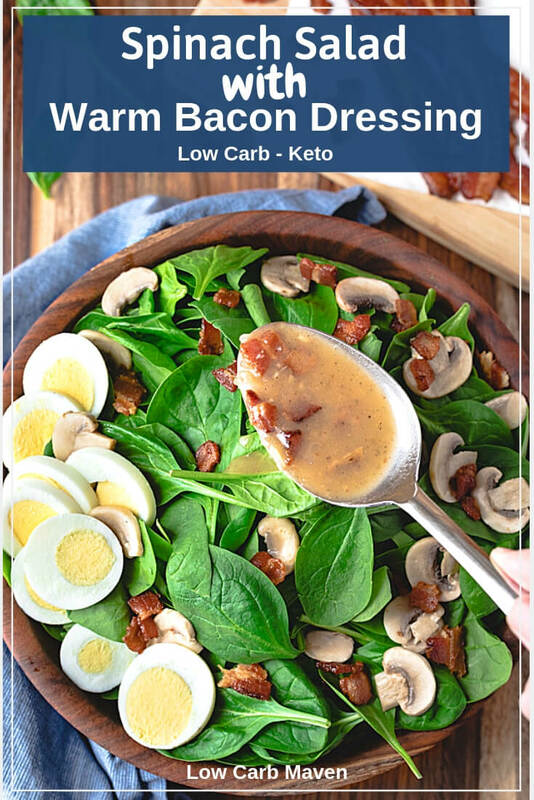 The traditional ingredients for spinach salad with warm bacon dressing is baby spinach, hard boiled egg, crispy bacon, red onion, and raw sliced mushrooms. The warm bacon dressing is made from the drippings leftover from cooking the bacon and poured over the spinach, causing slight wilting. 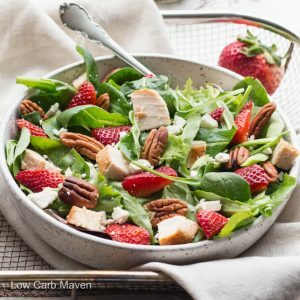 Upon researching this recipe, I saw many variations for spinach salad with warm bacon dressing. Some recipes add shrimp, apples, strawberries, or Mandarin oranges. There is also a variation on the warm bacon dressing using ketchup. Topping with blue cheese and walnuts sounds completely amazing! This recipe is very much in the tradition of the original recipe. I, too, start with baby spinach and hard boiled eggs. Cook diced bacon in a frying pan until crispy, remove. Add thinly sliced mushrooms to the pan and cook for a few seconds – until just cooked, remove. Cook the shallots in the warm bacon fat until translucent. Add red wine vinegar, whole grain mustard, brown sugar, dried tarragon, and salt and pepper. Adjust seasonings. 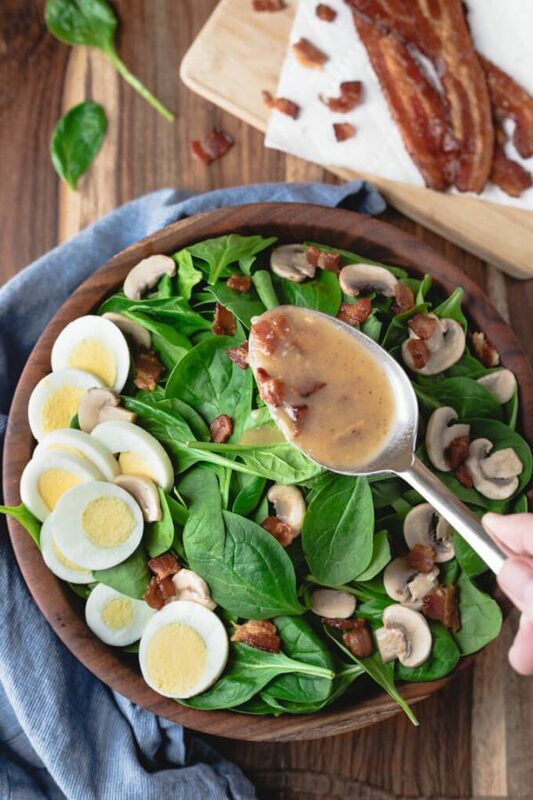 Toss the spinach with the bacon, mushrooms, and dressing. Add the hard boiled egg and serve. Feel free to leave out the mushrooms or egg and experiment with your own ingredients. NOTE: If you don’t like bacon, try the Balsamic Dressing in this Chicken Spinach Blueberry Salad. It’s VERY good. 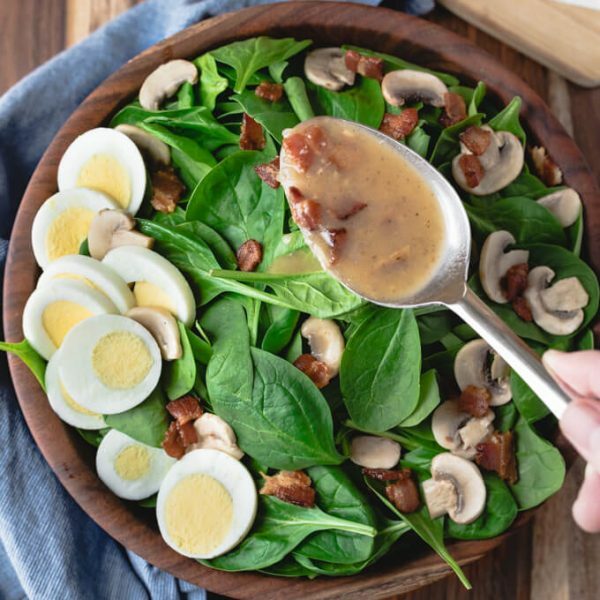 Fresh baby spinach with warm bacon dressing includes hard boiled eggs, bacon, mushrooms, and onions, mixed with a warm tangy-sweet dressing. Low Carb Keto. Dice bacon and put in a cold pan over medium heat. Cook until crisp, stirring occasionally, about 5-6 minutes. Remove bacon. Pour bacon grease into a small container to use for the dressing. While the bacon cooks, slice the mushrooms, finely chop the shallot, and slice or chop the eggs. Keeping the heat at medium, add the mushrooms to the pan and keep moving for a few seconds until lightly cooked, but not raw. Remove. Saute the shallots until translucent. Turn the heat to medium low and add the bacon grease, vinegar, Sukrin Gold, tarragon, and whole grain mustard, stir until the ingredients combine and emulsify. Salt and pepper to taste. Toss the hot dressing with the spinach and divide between 4 serving bowls. Taste to adjust seasoning. Top with mushrooms, bacon, and eggs. Serves 4 people at 3.34 g Net Carbs per serving. 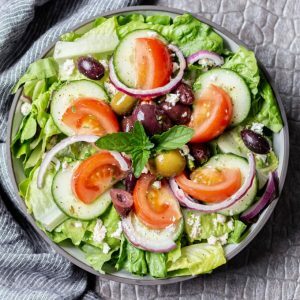 This salad is awesome it does not only look good, it also taste good and the nutrition facts will make you ask if is real sure it is. I have been craving this salad it was delicious! Thank you! I put the dressing in a mason jar and used my stick blender to combine everything, I preferred a smooth texture. It also helped to have it in the jar to rewarm the dressing. Go easy 20 seconds or it may explode in the microwave!